This book will redefine the term ”great game” for a new generation of elementary school students. It is destined to become your Number #1 collection of creative and skill- based games ever! This new instructional package provides a springboard for numerous common core connections. Provides a new level of creativity and movement- based learning. This resource uses an innovative set of flash cards (104-card deck) called the Infinity Flash CardsTM. 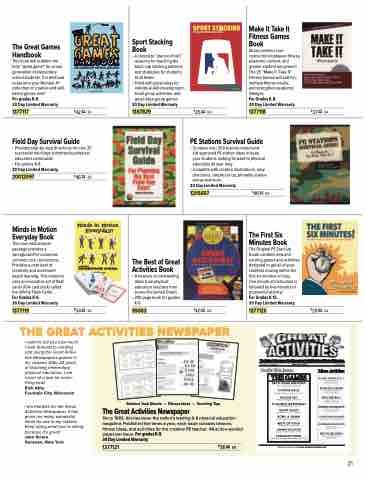 I want to tell you how much I look forward to reading and using the Great Activi- ties Newspapers games in my classes. After 22 years of teaching elementary physical education, I am never at a loss for some- thing new! I am thankful for the Great Activities Newspaper. It has given me many wonderful ideas for use in my classes. Keep doing what you’re doing, because it’s great! Show common core connections between fitness, academic content, and greater student enjoyment! multiply fitness results, and strengthen academic linkages.